description — Modelled values representing the distribution of Pacific white-sided dolphins in terms of relative densities. feature GIS data — BCMCA does not have permission to share data for this feature (see data custodians). Marxan metadata — As BCMCA does not use this feature in the analyses, Marxan metadata was not generated for this feature. Marxan-ready data — Either BCMCA does not have permission to share Marxan data for this feature (see data custodians), or BCMCA does not use this feature in the analyses and so no Marxan data was generated for this feature. All fields below are required (though your email address will not be published). restrictions — There are restrictions set on BCMCA distributing the raw data and feature data. When all of the required permissions have been received for a feature or set of features, please forward the email confirmations to the BCMCA data custodian at info@bcmca.ca to obtain the data. An index of all the data custodians for ALL features is available here. 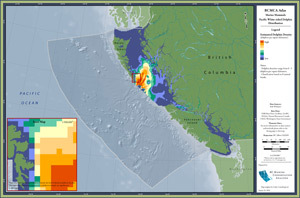 copyright © 2008–2019 British Columbia Marine Conservation Analysis / BC Conservation Foundation. website by Rocketday.